Pour le soir, ce petit chapeau de panne que pare une oiseau. Chapeaux de printemps. Direction artistique: G.P. JOUMARD. Before the curtain. Evening dress by Eugene Mossner. Art deco1922. The moonstruck. The bachelor 1920s. 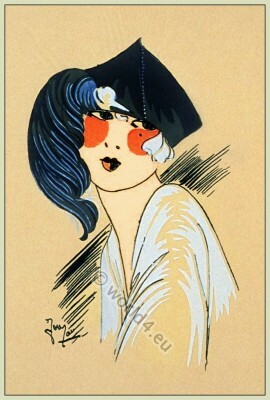 1929 • 20s • 20th Century • Art Deco Period • France • Haute couture • Les Creations Parisiennes. The next morning. Orchids from the house of Hermann Roche. Art deco tunics and bed jackets for home. The green veil. Coat of V. Mannheimer. Hunter. Sports Costumes of A. C. Steinhart. St. Moritz. Sports costume from Bresser.